This is the definition of $f(x)$. By itself it doesn't have a value. It just defines what it would mean to call the function $f$ on some value. Given a value for $x$, we can calculate the resulting value of $f(x)$. $f(2)$ evaluates to 11, $f(-1$) gives 5.
the parameter(s) of the function, 0 or more. Parameters are a comma-separated list of variables whose values will be supplied when the function is called. One or more statements, often ending with a return statement. 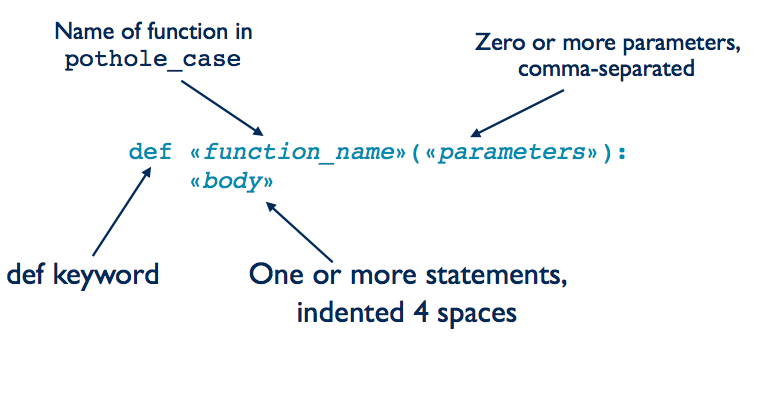 All body statements must be indented the same amount (usually 4 spaces). Evaluate the expresssion. The produces a value (which has a memory address). Exit the function and produce that value to the caller. Evaluate the arguments. These produce values. Each value has a memory address. Assign those values to the parameters. This stores the memory addresses of the values in the parameters. What is the name of the function? How many parameter(s) does the function have? What are the parameter(s) names? For function call f(8), what is the argument? When it is executed, what value does f(8) produce? Consider this code: result = f(4). After that statement is executed, what value does result refer to? Write an example call (or two) of how we will use the function we plan to write. Write the header for the function. That's the def line. Write the type contract -- the type for each parameter and the type of value that will be returned. Write a description of what the function does. Finally, write the code for the body of the function. Let's write a function that squares a number. Of course square isn't defined yet, so we can't actually call it. Instead just work out, what the function calls should produce. Step 2: Write the header, which is the line that starts with def. The function will have one parameter, which we named num, but we could have named it x, value, n, or even banana. Of course, it is best to pick a meaningful name. While you are at it, make the examples that you wrote be part of a triple-quoted string inside the function (make sure to indent them 4 spaces). This triple-quoted string is called a docstring, which stands for documentation string. Step 3: Add a type contract. Our function takes a single parameter which is a number. It returns a number. So the type contract is (number) -> number. Let's add that to our function. Step 4: Write the description and it to the doctstring. Step 5: Code the body. For this step, we write the Python statements that will be executed when the function is called. We will use a return statement to produce a value. Step 6: Test our function. For now, we will do this by calling on the examples we developed in Step 1.